The tip of the trussrod cover is cracked into 2 small pieces, with one of those pieces missing. This can be repaired with white epoxy glue, ....pressing 5 layers of a good quality masking tape tightly onto the front surface, ....then gluing the existing piece back on with the white epoxy while also filling in the missing chip. 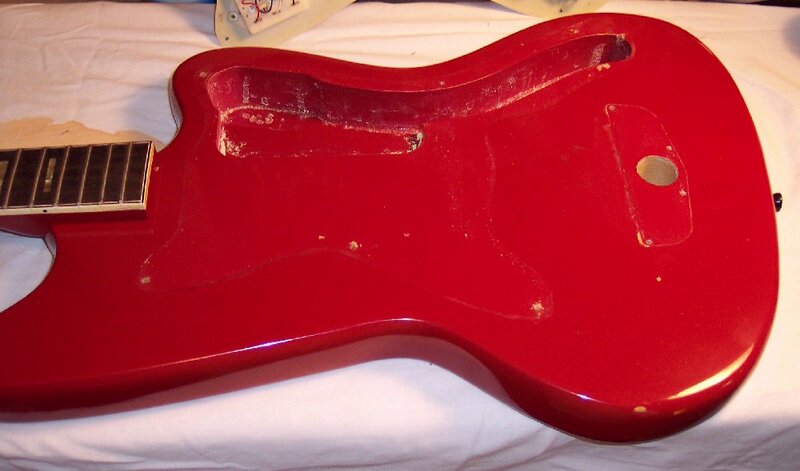 Some careful form-sanding and polishing will make the part look like new. Click Here to see two 45 year old white plastic knobs I repaired with white epoxy. Work page 2 of _. 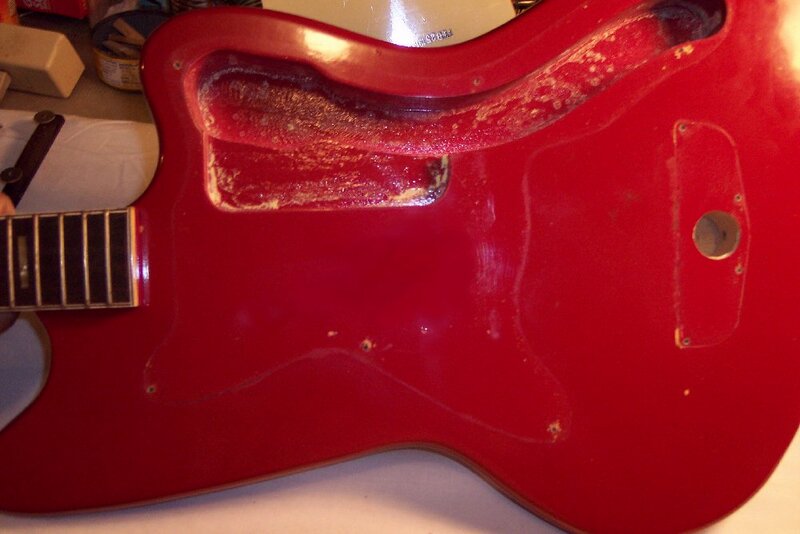 Check this out; As far as I can tell from a very close and intrigueing inspection, ...the pickguard and vibrato have never been removed before. 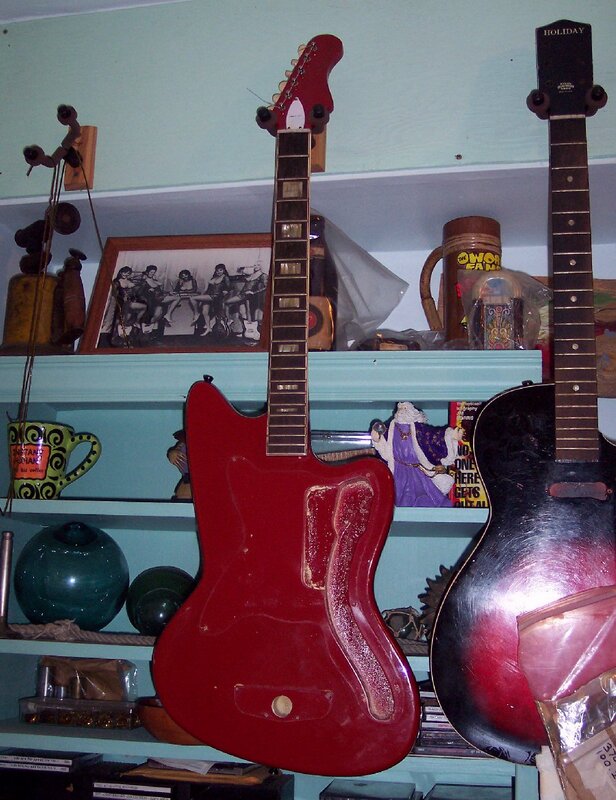 Original sawdust from the screwholes surrounded every screw hole, ....and sawdust from the vibrato hole being drilled after the guitar body was painted and polished, also got into the factory's polish still in the electronics cavity. After the body's paint dried the body was sprayed with polish that was polished with a polishing cloth; But the thick polish in the electronics cavity was tacky enough to grab sawdust when the vibrato hole was drilled later. The polish was put on in this sequence so that the guitar's parts being screwed on wouldn't stick to paint that takes a month or so to fully cure. The vibrato models' holes were drilled into bodies previously painted, dried, polished and pulled from that other part of the assembly line. ~~~~~~~ What looks like missing paint and light colored stains in the electronics cavity is different thicknesses of the sprayed-on factory polish ! The polish and sawdust is being carefully kept in place during the work. The fretboard and frets are hardly played and in excellent condition. This guitar is truely a "closet" treasure in Near Mint condition. She's hanging up while the electronics plate is inspected and vibrato parts are cleaned. It was not until I was restringing this guitar's final assembly that I noticed that the tuner whose clutch screw was different, also had a slightly diferent string post and ferrule. This most often occurs when the clutch screw falls out and is lost and eventually causes the string post and ferrule to fall out, often all simultaneously during a string change when there's no pressures on the tuner mechanism; ...and not fully understanding the problem the owner acquires the closest sting post, screw and ferrule he can find to replace with "new stuff". I installed a closer matching ferrule. 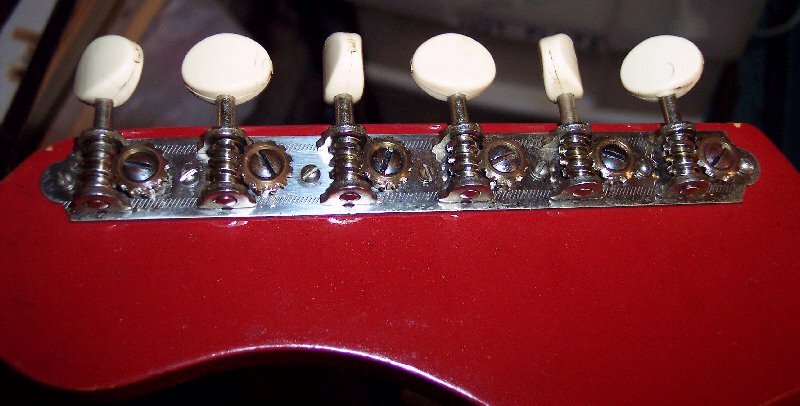 So when working on a guitar without the strings on, run a piece of guitar string through the tuners as shown above, to keep the string post ferrules or any insecure string posts from falling out when the strings are removed. Make sure the bent ends are long enough to not scratch the guitar. 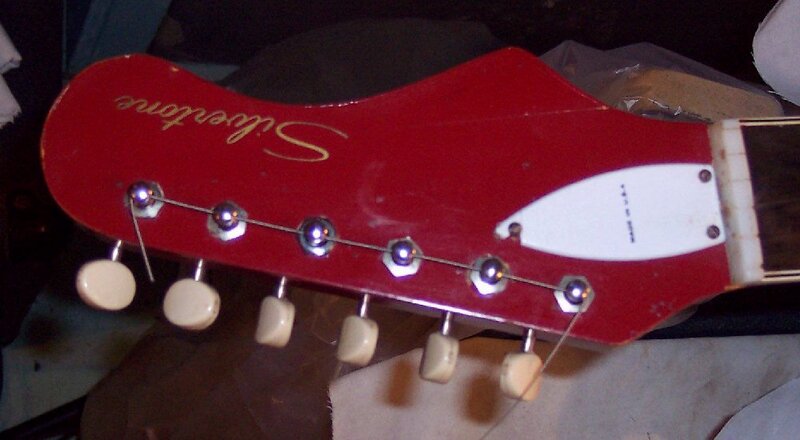 That one tuner's string-post gear screw was non-original phillips head type. Replaced the phillips head screw with proper period & patina screw.